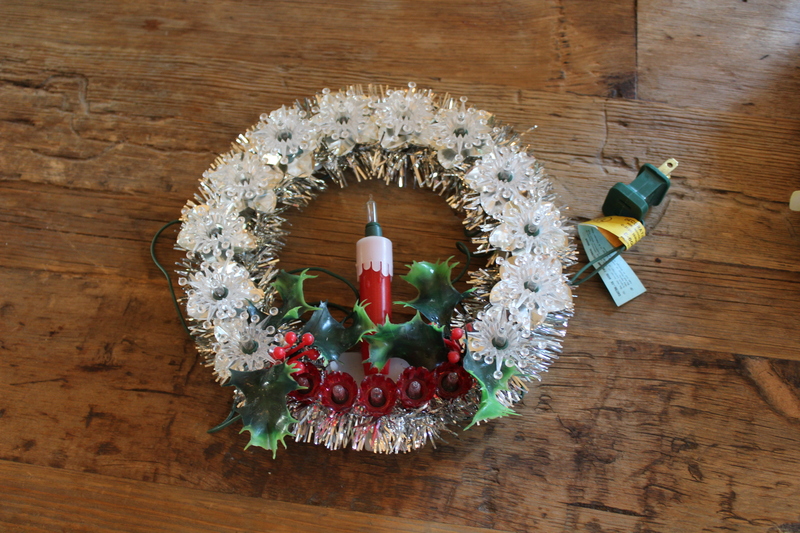 Home DIY Projects	Embellishing Christmas Wreaths! Happy Thursday, Friends! If you are like me, you’ve packed away your Fall decor and are hauling out the Christmas or Hanukkah decorations. I decided to put a spin on some of my old wreaths this year. Come see a few easy ideas on how to embellish Christmas wreaths! This year has been a new challenge for me. First, we moved to a new house and that is always tricky decorating a new place for the holidays. In our last house I had a favorite spot for everything! Second, this house is smaller than our last house, so some of my decorations simply won’t fit. And frankly, I’m tired of some of my decorations. This year I decided to put a spin on a few of my old wreaths so they would feel fresh and new. Take this wreath for example. It’s pretty, but I wanted to kick it up a notch, as Emeril Lagasse says. I have a white, sparkly Merry Christmas sign from a few years ago. It hangs on a white ribbon. Using a command strip attached to the window frame, I slipped the white ribbon over the hook and put the wreath over the top of the sign on the same hook. I pulled the sign through the center of the wreath to the front. Then I disguised the ribbon with poinsettia leaves and some of the greenery. Easy, peasy. I did something similar with this vintage wreath. The Merry Christmas sign was bought several years later than the wreath, but the two look like they belong together. This sweet wreath is hanging over our fireplace. Sadly, we have no mantle this year, but I’m hoping if I’m very good this year, Santa will bring/make me one next year. This white wreath came from Pottery Barn. I like the simplicity of it and even though it is not a typical Christmas wreath I turned it into one for the holidays. I found this cute little vintage wreath at an antique store yesterday. (On a side note, I found a NEW antique store in my new town. Well, it’s new to me and to say I am thrilled is an understatement! I picked up a few other vintage ornaments and goodies while I was there. Yay!) Anyway, this little wreath was $4 and it works! I tucked the little lighted wreath inside the white one and used some fine wire to hold it into place. I fed the cord through the back and used an extension cord. Wallah! A Christmas wreath! Also I appreciate the fact I took a small decoration and turned it into something more substantial. And to my great surprise, i.e. shock, once the lights warmed up, they started blinking. I can’t say that was the desired effect, but what is Christmas without a little borderline tackiness? Similarly, this faux boxwood wreath is not a typical Christmas wreath. By adding a red bow and some gold bells, now it looks like a festive Christmas wreath! I could even add some white lights for added sparkle. Outside on the terrance I added some garland and white lights. In the past I used this garland on our staircase. But, alas, there is no banister in this house, so outside it went! On each column I added an artificial wreath from Walmart. The wreaths are pre-lit and were a steal for only $9.97. I bought 2. I added an oversized red bow to each wreath. At first I wanted to use real wreaths, but they were $20 each at the local nursery, so for the price of one real one, I have 2 that I can use for years to come. So, if you have some tired wreaths, why not give them a mini-makeover with a bit of ribbon, bows, bells or signs? I’m really getting into the Christmas spirit! How about you?